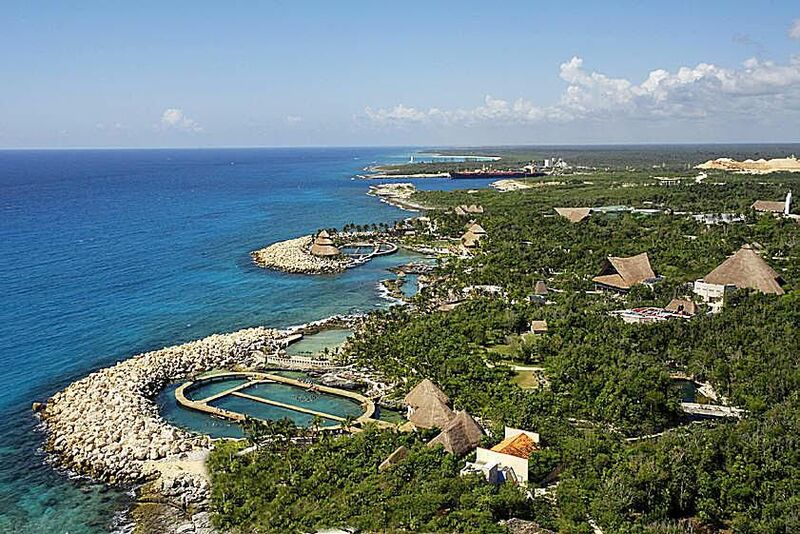 Xcaret is a popular eco-archeological theme park on the Riviera Maya area south of Cancun. It is located just four miles from Playa del Carmen. Plan to spend an entire day, swimming in an underground river, snorkeling, and touring a butterfly pavilion, aquarium, and Mayan village. If you like, you can also sign up for a premium experience such as a dolphin or shark encounter. The Xcaret park extends over 200 acres, so wear comfortable shoes and be prepared to do some walking. Fortunately, there's a lot of shade and lush foliage. Rivers are a highlight at Xcaret, especially the Underground River snorkeling trip. This photo was taken on a slow, 20-minute boat float on the Paradise River. It was very pretty, but hot; families on a first-time visit may prefer to use that chunk of time elsewhere. The main river experience at Xcaret is a snorkeling trip down two underground rivers. Guests are issued full gear: life jackets, snorkels, flippers, and masks. Kids as young as age 5 can be fitted out. The trip covers over one kilometer of the river and takes about 20 minutes; there are several points along the way where you can rest in a nice spot, or exit if a child is tired. After guests finish the underground river swim, they'll find a bag waiting with their dry clothes and other belongings. Tip: check the last departure time for the underground river swim so you don't miss this experience, which is included in the price of admission. Snorkeling in this lagoon is another popular activity. Xcaret has several beach areas and inlets where you can float. Xcaret has many lovely areas to relax. The grounds are extensive, and after you've toured the butterfly pavilion, Mayan village, coral reef aquarium, orchids greenhouse, and more, you may be ready for some lounger or hammock time. Pools offer a midday break and a place to cool down for kids. After you've toured Jaguar Island, the orchid greenhouse, coral reef aquarium, and butterfly pavilion, hammocks seem like a good idea. Kids love this kind of challenge. At Jaguar Island, look for pumas and a black jaguar. In several large pools, you can see giant sea turtles. "Xcaret" is a Mayan word meaning "small inlet," and the park has several small Mayan ruins. The Mayan settlement in this area was at its height from 1400 to 1517 AD. Xcaret also has a Mayan village area. There are many authentic Mayan ruins on the Yucatan Peninsula. In one of the live performances, "Voladores de Papantla," Pole flyers perform a ceremony worshipping the sun god while 30 meters in the air. The four flying men represent the four elements: earth, air, fire, and water. Surprise performance near the entrance to Xcaret. This sand arena is the venue for an excellent horse-and-rider show. During the "Mexican Charreria" horses and their riders show off their skills, and do Mexican rodeo tricks. Lady riders ("adelitas") wear especially colorful outfits. Watch the show while dining at the La Cocina restaurant, which has delicious Mexican specialties. The night show typically starts off with an amazing ancient Mayan ball game called Pok-A-Tok. Imagine basketball with a hoop that's mounted vertically a wall, a sloped court, and a heavy ball that can only be hit with the hips. Then come the many dancers in colorful costumes. Audience reaction at the night show adds to the fun. Most of the audience is Mexican, and people recognize and cheer the regional songs and dances. The night show takes place in a huge covered amphitheater, where horses take to the stage at several times. During our visit, a panoramic sweep through Mexican history was followed by a medley of regional songs. The night show is a spectacular production that's not to be missed. Families with kids are everywhere, and the music, fast pace, and cast of hundreds will keep even little kids and teenagers entertained. Xcaret is a popular wedding destination. Above is the bougainvillea-covered chapel. Other areas are used too, including some spectacular natural settings. Note: Xcaret can easily be visited independently without an excursion from your resort. Depending on the number in your party, it may save money to take a taxi from Playa del Carmen; if your resort is near the highway, you can even hop on one of the frequent local buses, and for your return journey, you'll find taxis waiting at the Xcaret exit when the night show finishes. With more than 40 activities, attractions and shows, it’s almost impossible to see the whole park in one day. If you have the time to come back another day, realize that your second day in Xcaret for free if you pay for your tickets with MasterCard. The ticket price for kids under 12 is half of the adult ticket.